“In 1944 my grandfather opened the Carl Granger & Sons jewelry store near the Findley Market area of Cincinnati. My father worked as a watchmaker under my grandfather’s training. 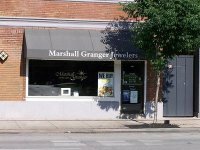 In 1959 my father opened Marshall Granger Jewelers in Ft Thomas, KY. In 1976 I purchased the store from my mother after my father’s untimely death. Several years ago, we moved to our new location at 3955 Alexandria Pike in Cold Spring, KY.